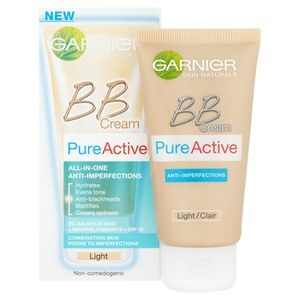 Perfect the look of combination to oily skin with Garnier's Oil Free Medium BB Cream, a mattifying cream with optimal coverage that expertly blurs imperfections whilst providing UV protection. 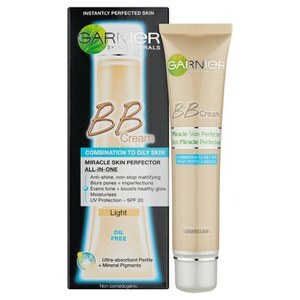 With a lightweight, oil-free formula, the multi-tasking BB cream works to even out your skin tone, smooth the appearance of fine lines and provide twenty four hour hydration for healthy looking, radiant skin. Utilising mineral pigments to instantly perfect, and absorbent perlite to combat shine, the cream soaks up excess oil for a controlled and balanced looking complexion. 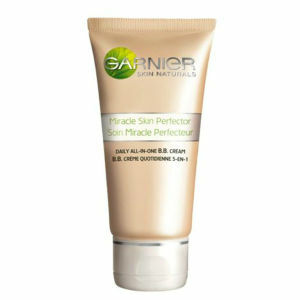 Skin looks even, glowing and naturally perfect. - K.N. Adorei! Ele deixa a pele com uma textura incrivel, recomendo que comprem!